Superior drain line maintenance products formulated to solve build-up problems resulting from food particulates and other organic solids. 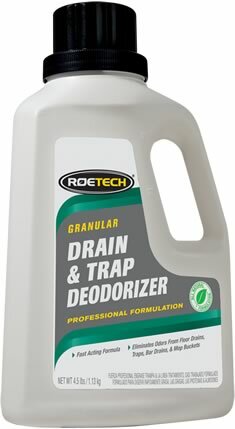 ROETECH Drain & Trap Deodorizer can be used to oxidize malodors without using bleach, disinfectants, or harsh chemicals. Use DTD regularly to end odors associated with floor drains in food service areas, bar drains where stale beer odors predominate and to deodorize other items such as mops or buckets.. Safe yet powerful, DTD works via chemical oxidation of odorous organic materials changing them into non-odorous bi-products.